What would be the subject of this week’s blog? That was kinda hard. I have not, as I feared when I took this weekly, run out of things to say, muchachos, but sometimes a topic doesn't immediately suggest itself. Those “sometimes” usually being the times when not much is going on around here astronomically. Following my last minute comet-save recounted last week, I thought I’d so some Moon pictures for another installment of my Destination Moon project. I still had the C11, Big Bertha, set up in the backyard following my abortive try for asteroid 2004 BL86. Alas, the seeing was just not good enough. Even given my humble standards, not a single image was usable. OK, I’d back off to a more forgiving C8 the next evening. Nope. The .avis I got with my 8-incher, Celeste, were better but not better enough. Into the recycle bin they went. Should I go RSpecing again? I’ve promised myself I will re-familiarize myself with RSpec, that wonderful spectroscopy software. Unfortunately, the seeing was still bad enough following my failed lunar voyages to suggest I would be wasting my time. Couldn't even do any visual observing, since clouds and rain were now moving back in. Astronomical road-trips? I would be heading down to the Chiefland Astronomy Village next dark of the Moon, but that was still weeks away. I thunk and I thunk and I thunk, but I was stumped. Till one afternoon I was hunting something or other out in the Shop. I opened a cabinet, pulled out a box, looked in, and what should I see but my first real planetary camera, the good, old SAC 7B. Which brought to mind my adventures with that humble CCD—which I have talked about here before—but even moreso, it reminded me of all the fun I had during the great Mars opposition of 2003, something I haven’t talked with y’all about at length. By 2003, Unk had been observing Mars in decidedly on-again, off-again fashion for over three decades. I’d been at least trying to see the planet since 1965. Mars, maybe even more than Saturn, was the world young Rod, like other space-crazy kids in the 1960s, wanted to see with his own eyes. Even when I was the greenest of greenhorns, I knew that most of the time Mars was nothing more than a subdued orangish star-like object. However, I also knew there were times, “oppositions,” when the planet was close to us, when Mars showed his mysterious face to Earthlings and their puny telescopes. Even though Mars was at opposition the spring I got my first telescope, a 3-inch Tasco Newtonian, I don’t believe I saw him then. 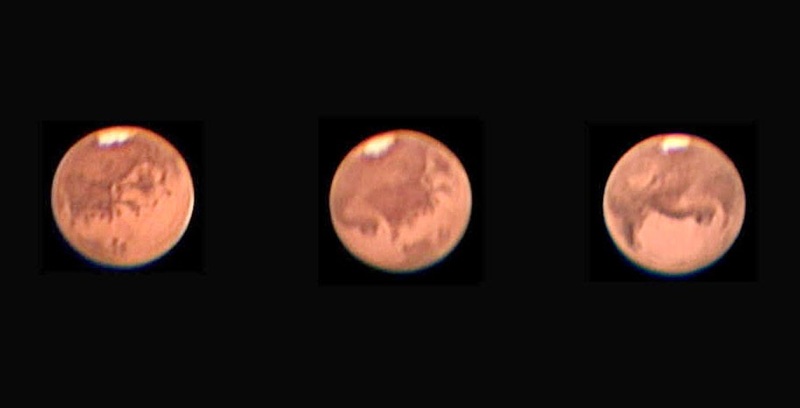 I knew Mars was visible and putting on some kind of a show since, in them days, our newspaper, The Mobile Press, carried occasional little filler-blurbs related to “space,” and I’d read one that mentioned Mars was once again close to Earth. But I had no idea how to find him. 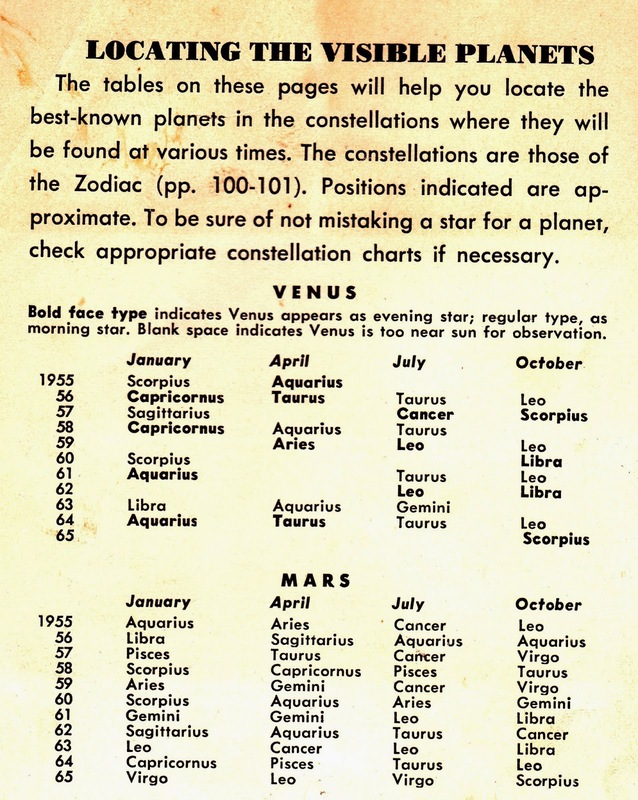 My first issue of Sky & Telescope had yet to arrive, and my only resource was my copy of the Little Golden Guide, Stars, which, while it had some planetary tables and gave the constellation Mars was sailing through that April, Leo, it didn't pin down the planet’s exact position. I did look around for Mars in Leo's area occasionally, but none of the stars looked as obviously different to my naked eye as I thought Mars should. Certainly nothing I got in my low power eyepiece looked like anything but a pinpoint (it’s likely I actually did see Mars but mistook him for a bright star). In retrospect, I didn’t miss much. 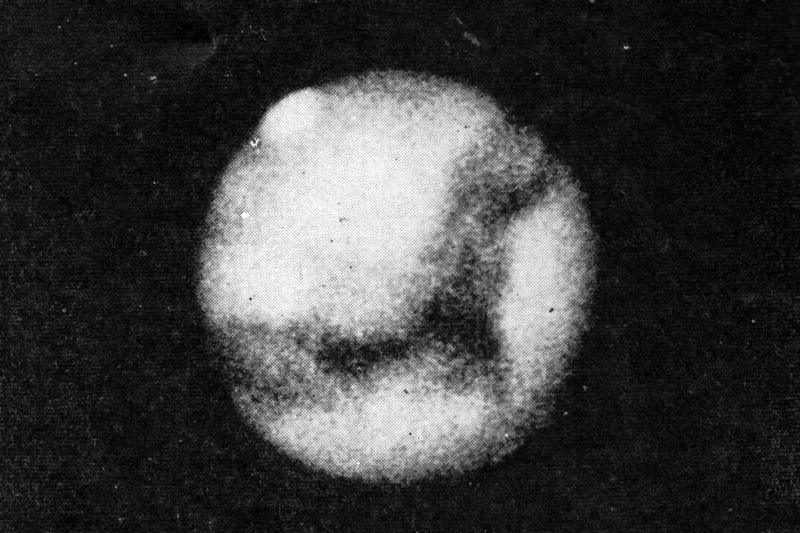 Mars was small, 14”, that opposition, and would have been a tiny, featureless b-b in my somewhat putrid little scope. The next opposition of Mars was in April of 1967, and he was better, but only a little better, 15.5”. This was the first one I was there for. Not only did I have a mucho bettero telescope, my 4.25-inch Palomar Junior reflector, which, if not exactly a planetary powerhouse due to its small aperture, did deliver sharp images with its f/10 (actually closer to f/11) spherical primary mirror. Also, I had learned to find stuff in the sky. The epiphany arriving in December of 1965, when, just after taking my first look at M42, I captured M78 by star-hopping to it—not that I knew what I was doing was called “star-hopping” (which term may not even have been in use at then). And I had Sky & Telescope to guide me. I comprehended that Mars was small and far, far away even when closest to Earth, but, still, this was MARS. There must be more to it than just Patrick’s small, red disk. To be honest, what stuck in my mind from the above quote was not “small, red, disk” but “canals and blue green vegetation,” the very things my astronomy mentor was warning me not to expect. So, one warm spring night I finally tracked down the mysterious fourth planet. Amazingly, it wasn’t even hard. Even if I hadn’t done a pretty good job or learning the constellations since that wonderful morning when the Old Man had walked into my room bearing the Tasco—I even knew subdued Virgo where the planet was now hanging out —more experienced me couldn’t have missed it. 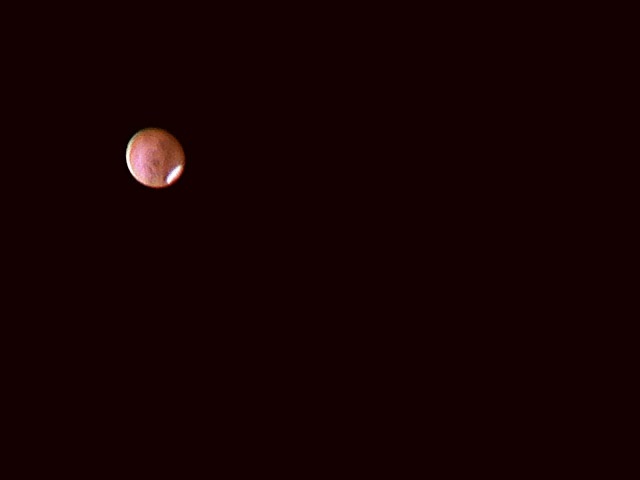 Even though this was an average opposition at best, there was Mars just burning up the sky, looking like a baleful red eye gazing down at the Rodster. If only the view in the Pal Junior had lived up the promise of the planet’s naked eye appearance. It didn’t, of course. Not surprisingly, Patrick Moore was right on the freaking money. There were neither razor thin canals nor mysterious forests in view. It was just that damned tiny red ball. As I stared into my ½-inch Ramsden eyepiece, which delivered a magnification of 96x, I thought I caught the barest hint of a polar ice cap. But I wasn’t sure. My big mistake? I didn’t take Patrick’s other words seriously. In addition to warning that I wouldn’t see imaginary canals and forests, he went on reassuringly to say that, with experience, I would be able to make out not just that polar cap, but also fascinating dark areas and more. I wasn’t convinced. I looked at Mars briefly a couple more times that opposition and that was it. Frankly, young Unk was not big on patience and perseverance. It would take another decade and some hard knocks before I learned better. I filed Mars away as a bust, and went back to trying to see Messier objects. Was I disappointed? Sort of, but not really surprised. Beyond Patrick’s cautions, the photograph of Mars in my dog-eared copy of The New Handbook of the Heavens suggested I might not see much of anything. Though taken with the giant Yerkes refractor, the picture (excellent for the day) was disturbingly blurry. And so it went. I put the planet out of mind, filing it away with Angry Red Planet and the other stuff of childhood. Oh, I did take a couple of stabs at it during the good oppositions of 1986 and 1988, but in the former case I was distracted by Comet Halley mania, and in the latter, by a marriage well on its way to disintegrating. When I did look with my C8, I didn't do more than take quick peeps. No filters, no waiting for nights of especially good seeing, just “Well, there it is” and moving on after a minute or so. Nothing much changed till 1995. My life was finally settled and happy with Miss Dorothy at my side, and I had the biggest telescope I’d ever owned, Old Betsy, a 12.5-inch Dobsonian. Betsy, in addition to pulling a lot of surprisingly faint stuff out of our bright Garden District sky, was, biggest surprise of all, something of a planetary powerhouse with an excellent primary mirror despite its humble Meade pedigree. The most important thing in helping me begin to see Mars, though, was the patience and perseverance I’d been able to develop (finally). When I first got Betsy, I began spending hours with Jupiter, trying many different magnifications and using different colored filters. I saw more of the King of the Solar System than I ever had in my life. Might the same things work with Mars? The 1995 opposition wasn’t much of one. At a maximum size of 13.8 arc seconds, the angry one was about a quarter the size of Jupiter’s average diameter. That didn’t stop me. Seeing detail wasn’t easy. I had to wait for Mars to get as high as he could, and I had to wait for particularly stable February nights (a problem even on the Gulf Coast) so I could use high power, but from the get-go I was scoring coups. First night out, there was Syrtis Major, clear as a bell. Oh, and the polar cap was putting Unk’s eye out; how had I ever found it difficult? I continued night after night, sometimes seeing new features, sometimes being thwarted by clouds or seeing. But I almost always saw something. The one thing I never did do, though? Photograph the planet. Given that my (film) images of much easier Jupiter resembled custard pies—at best—I figured I’d be wasting my time. Two things changed my mind about that over the following eight years: the promise of the 2003 opposition, when Mars would be bigger than he’d been for centuries or would be again for centuries, and the coming of electronic photography. 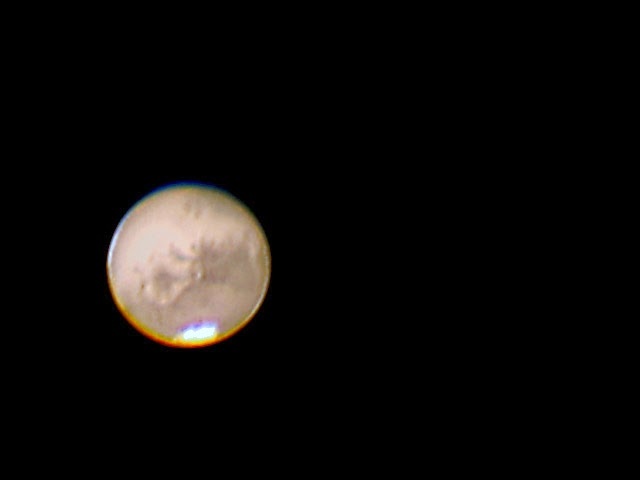 As ought-three approached, I assumed I’d be doing my Mars picture taking with my first CCD camera, a Starlight Xpress MX516. It had done a pretty good job on Jupiter. Hell, it had bettered my film images by a long shot, and was a considerable improvement over my camcorder experiments (the camcorder results were pitiful). The MX516 probably would have done a respectable job on Mars, but as 2003 got underway, I decided I wasn’t happy with the camera. There were several reasons for that, but the foremost one was that it wasn't color. To me, the planets cry out for color. I decided I’d sell the camera on Astromart and search for the elusive more better gooder, which I at first thought was Starlight Xpress color CCD cam, the MX7C. Soon, however, I learned that More Better Gooder for the Solar System was not another CCD camera. No, the path to Solar System success, it seemed, lay on another path. The webcam path. By 2003, amateurs had learned that webcams, the little USB video cameras used for video conferencing (and other somewhat less savory things) on the Internet were the way to go. Take an .avi movie of a planet, use software to select the best frames out of hundreds or thousands, stack those frames into a final image with this new program, Registax, and you had planetary and lunar images easily better than the best pro Solar System photos of the decade before. I had already begun playing around with webcams, getting a Quickcam off the dang eBay, and using it to take the best lunar closeups of my life. Better than my best photographs, better than my best camcorder videos. That humble 15-dollar Quickcam could no doubt have done surprisingly nice Mars images, but since I would be selling the MX516, I could upgrade. The Quickcam worked, but its sensor, even by webcam standards, was small and low resolution, producing images with a maximum size of 320x240. What would be like the Quickcam, but better for astronomy? Lots of Web browsing and Internet astro-forum chatting (Yahoogroups and the day’s equivalent of the Cloudy Nights Forums, sci.astro.amateur) revealed that that was spelled S-A-C.
I’ve talked a little about SAC Imaging here before, but only a little. Frankly, I don’t know that much and I am not sure how much more than what I do know there is to tell, anyhow. The gist? This is the story as it’s been told to me. I’d welcome corrections from y’all. “SAC” does not stand for “Strategic Air Command,” Unk’s old outfit. It is “Sonfest Astronomical Cameras.” Wha? Apparently a dude down in Melbourne, Florida, Bill Snyder, had a business promoting Christian music concerts, “Son-fest Promotions.” He was also apparently very interested in astronomy, and decided to begin selling astronomical CCD cameras. Well, sorta. In the beginning, they were CCD cameras only in the sense that back in the early years of this century most webcams had (small) CCD chips rather than CMOS sensors. The SACs were humble things, just Logitech Quickcams that were repackaged in more robust bodies and equipped with 1.25-inch nosepieces for insertion in a focuser or Barlow. Yeah, “humble” is the word, but the SAC cams hit the marketplace at the perfect time, just as amateurs were discovering how good webcams were for imaging the Solar System—how amazing they were for that task. Snyder didn’t stand still. When he met with some success, he began offering upgraded and more interesting cameras. Initially, that was the SAC 7B, which featured a Peltier cooler and was modified to yield long exposures so it could (supposedly) image the deep sky as well as the planets. 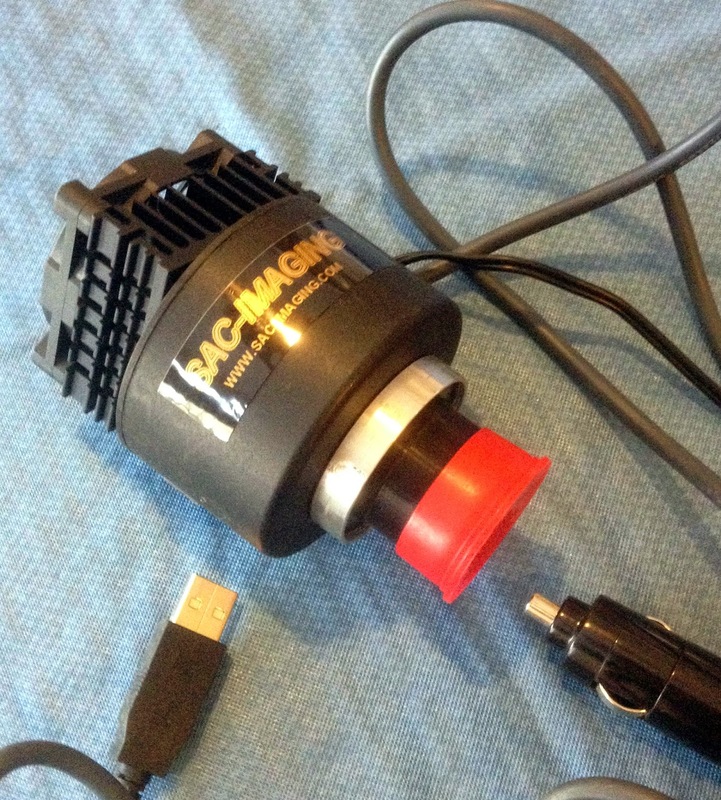 The SAC 7B was remarkably popular, enabling SAC to do the SAC 8, a more or less genuine CCD camera capable of real deep sky work. The SAC 7B was simply too noisy to be much good there, though its long exposure mode was useful for imaging Uranus, Neptune, Pluto, and the dimmer moons of the outer worlds. The SAC 8 was followed by the SAC 10 (designed in part by CCD Labs’ Bill Behrens). CCD/imaging software guru Craig Stark also had a hand in the project. The 10, with its, for the time, very impressive 3.3 megapixel sensor, was supposed to land SAC in the big-time of CCD imaging. Then, suddenly, the SAC story ended. What happened? As is sometimes the case, apparently too much success rather than too little killed SAC. The owner made a deal with Orion (Telescope and Binocular Center) to furnish what was essentially the SAC 8 with an Orion nametag on it. Alas, Mr. Snyder couldn’t produce enough cameras to keep up with demand from Orion. He also couldn’t produce the SAC 10 cameras in numbers large enough to satisfy orders. QA problems also began to mount. Things spun out of control and SAC crashed. As far as I know, Snyder went back to his primary business—which was neither concert promoting nor camera building, but, I’ve been told, managing a motel. I am still sorry SAC is gone. Bill Snyder had some great ideas, hired some great people, and I believe that if he’d been able to stay in business there’d be far more choices in the low-medium price CCD arena than there are today (i.e. very few). Anyhow, SAC was great while it lasted, and Mr. Snyder was responsible for me getting the Mars images of a lifetime. As soon as I heard about the SAC 7B, I knew it was for me. It produced 640x480 images, twice the size of my Quickcam’s, had that cooler and the long exposure mod in case I wanted to experiment with longer exposures, and was ready to go out of the box. No hot gluing a 35mm film canister on the front of the camera to serve as a nosepiece like we used to do with webcams. In retrospect, I could have probably just bought the less expensive SAC 7 (no “B”), the air-cooled (no Peltier) version of the camera, and I was tempted to do that, but I’d sold my MX516 for a decent price on Astromart, so I figured I’d get the top of the line SAC. I gave Mr. Snyder my credit card number. I ordered in early spring, and after a couple of weeks of no camera appearing on Chaos Manor South’s front porch, I began to sweat. The planet would be getting big soon, and now I didn't even have that dadgum Starlight Xpress to use on it. I understood Bill probably built cameras as orders were received, so I tried to be patient. Finally I couldn’t stand it anymore and fired off an email. The response was rapid, assuring me I’d soon have my SAC. When it arrived, I was fairly impressed. No, the build quality wasn't comparable to the machined beauty of the MX516, but it was alright. Robust enough (tin-can-like) metal body. Good hefty cables for USB, Peltier power, and the long exposure interface. The power supply provided for the cooler was impressive in its capacity. It was undoubtedly just a surplus PC switching power supply, but it was in a nice plastic box and had a cigarette lighter output (all these years later I still use it for various things). The only think I didn’t like about the camera was the included software, AstroVideo. It appeared to be capable, but not very user friendly, and you know how I am about that. No problemo. My astro-BBS surfing had turned up a program many webcammers were using, K3CCD Tools. It did almost as much as AstroVideo, but in a less convoluted fashion. Today, it has been surpassed by programs like FireCapture, but it is still very usable. After playing with an evaluation copy, I handed over my bucks for K3CCD right quick. With the software in place, it looked like we was ready to go. The opposition itself was almost anticlimactic because it went so smoothly. The weather usually cooperated, and my friend Pat and I were able to live up to our vow to take advantage of every second of Mars. It was a wild time if you were an amateur astronomer. We were all obsessed by Mars; some of us even moreso than others. I was a speaker at ALCON 2003 in Nashville, and hated to give up a few nights of the planet in July. I did, however, and had a good time. Others were not so willing to part with the Old Red for even a little while. Legendary planetary imager Don Parker flew in, gave his talk, and flew right back out to get at Mars again that night. Every clear evening, and there were plenty of them, I’d set up one of my three driven scopes in Chaos Manor South's backyard. Often that was Celestron Ultima 8, Celeste (then still on her non-goto fork). I also used the 8-inch Konus (Synta) f/5 Newtonian I'd bought to help do some of the observing for my book, The Urban Astronomer’s Guide. When I needed horsepower, it was my new NexStar 11, Big Bertha. Even with our often good seeing, however, the focal length of the 11 tended to be a bit much most of the time. The Konus, in contrast, was too short and was mainly useful when the seeing was punk. The C8? As C8s always are, it was JUST RIGHT. I did a little “just looking” with eyepieces on some nights, but mostly I let Pat take care of that end of the opposition. My game was pictures of Mars. Initially, I wasn’t sure how good they’d be, but I found out in a right quick hurry. On the very first evening with the camera in a 2x Barlow plugged into the visual back of the C8, Mars was surprisingly large, even in the spring (opposition didn’t come till August). And, hell, I could see signs of detail in the image on my monitor. Not just the polar cap, but those always elusive dark markings, the supposed BLUE-GREEN VEGETATION of my boyhood. My mind wasn't truly blown, however, till I ran the night’s .avi movie files through Registax. I was somewhat familiar with the program already from experimenting with it with some of my camcorder images, but I didn't expect anything like what I got. What I got when I finished fooling with the program’s “wavelet sliders” (sharpening filters) was the best planetary images of my life. And not just that. The detail was indeed in excess of what Pic du Midi and other professional outfits had done a decade before. See the video below to get an idea of the difference Registax made. So it went, night after night after night. As the planet rotated, more and more mysterious features came into view and went on the hard drive (of the desktop computer I dragged into the backyard). Syrtis Major, Solis Lacus, Mons Olympus. I toured all those fabled sites, and almost felt as if I were on the surface with the crew of Angry Red Planet’s Rocketship MR-1. Then August was past and Mars was dwindling back to its normal pink b-b aspect. Was I sorry to see it go? Dang right. However, I must admit the opposition almost exhausted me—Pat said the same thing. Night after night with one target, it was the most sustained planetary campaign of my amateur career, with even my most enthusiastic lunar tears being a distant second. Will I return to Mars? I haven't, not with a camera, though I have visited the other planets with my webcams, which have slowly evolved into more sophisticated planetary cameras like the ZWO ASI120MC I use now. However, Mars is growing again from is puny 14” diameter of recent oppositions to an impressive 24” in 2018, just a smidge smaller than in 2003. You can bet I’ll have boots on that red, red ground when that happens, muchachos. Great reading Mr. Rod. All the references to the 60s and 70s reminded me of my early days of looking through my 60 mm x 800 mm Selsi scope (that I still have and use) .